Check out Smart Price Moving reviews from Google, Yelp & Facebook all in one place! Looking for highly recommended professional movers? We’re your guys! 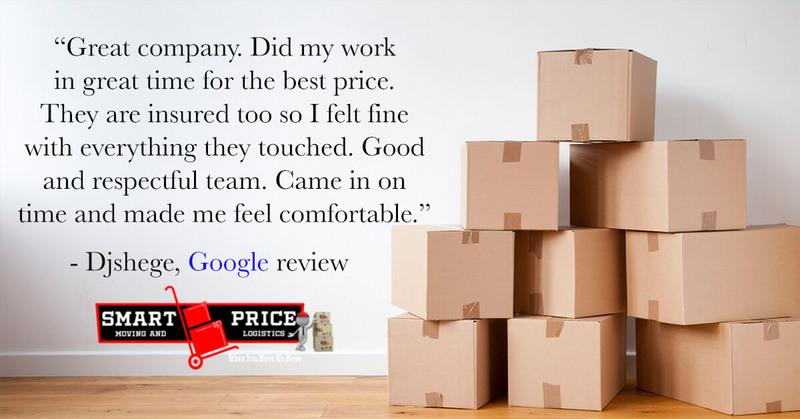 Local, friendly and always willing to go the extra mile, we put our customers first—and our 5-star professional moving company reviews prove it. You won’t be disappointed when you hire Smart Price Moving for your relocation move. We make moving easy for you and your satisfaction is our number one concern. 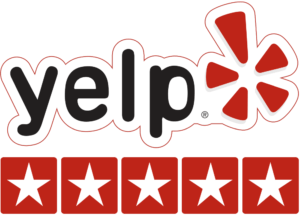 Check out some of our reviews and then get a free quote online or by giving us a call at (862)253-4436. We could not have been happier with the experience, efficiency, and professionalism the team had. They were accommodating with all of our moving needs. We would hire them again without hesitation or reservation. If you are looking for a moving company, then Smart Price Moving is the place to go! These guys are the best! They did a last minute move for my husband and I. They arrived early and finished before expected. They had a positive attitude the whole time and were upbeat. They made the move easy. We were very satisfied. 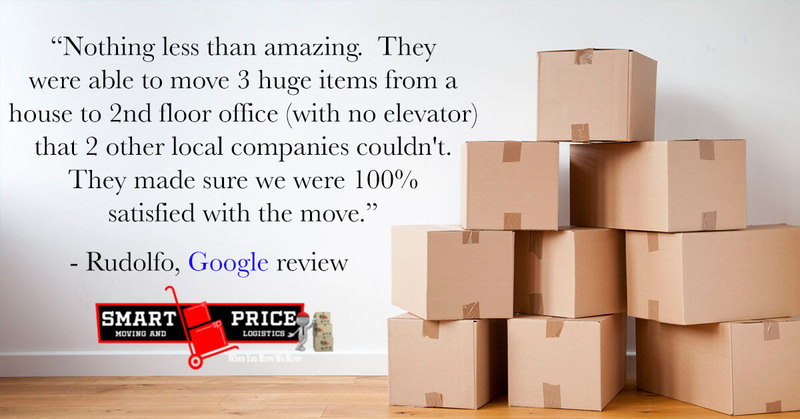 Thanks for all your help Smart Price Moving and Logistics! My experience was wonderful. The movers were strong, helpful and polite. All of my contacts with the company were excellent!! 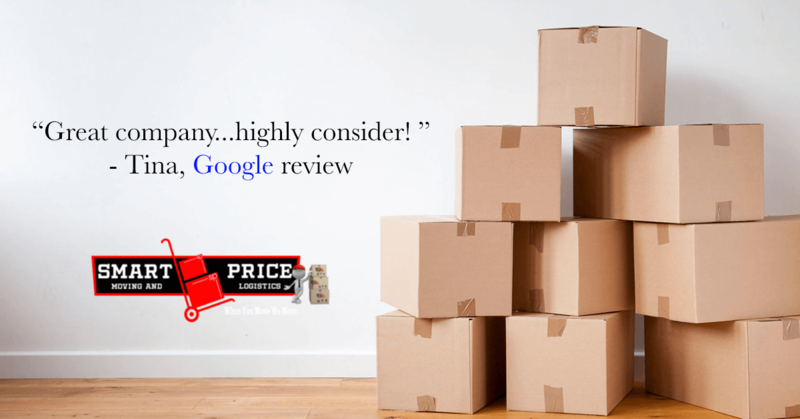 It has to be an exceptional experience for me to post a positive online review and I’m certain that has never been the case until now regarding a moving company. From the first contact, we had with Smart Price Moving until they completed our move they were the most professional, respectful and hard working team we’ve ever used for moving. And we’ve moved many times. Jabari and the guys were prompt, took extreme care of all our furniture and worked non-stop to make the entire moving experience as stress-free as moving can be. We could not have selected a better moving company and strongly recommend them for your move. They were a pleasure to work with. Jabari and his team are absolutely amazing – pleasant, efficient and professional. I had a really big move recently and these guys did a fantastic job! I appreciate their attention to detail and the reasonable prices. Having the fastest, most careful and reliable movers really helps alleviate the stress of moving. I would use them again and I highly recommend them! They were efficient and treated my things as if they were their own. I can’t thank them enough for making the move to run so smoothly. Also, they made sure everything was wrapped to prevent nicks and breakage. 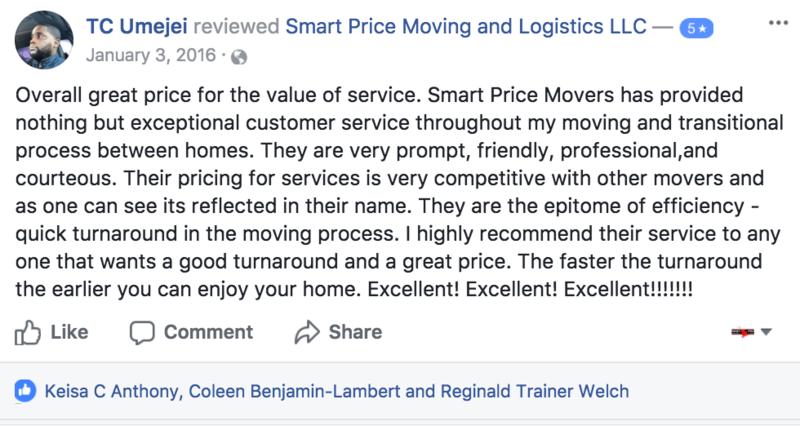 I wholeheartedly recommend Smart Price Moving. Outstanding moving company to work with.Prices are reasonable and the staff is courteous, professional and friendly. Make the smart move and do business the smart way with Smart Price Moving company. I can’t say enough good things. They were on time, they were kind and polite, they moved very quickly, even though I had furniture that had to be taken apart into small pieces. Then when we got to my new location, there was a couch left behind that couldn’t fit through the door. No worries! They had it apart and by the curb in minutes. Plus the price was actually lower than expected. I don’t want to use any other movers in the future. I usually do not write reviews, but in this case, I just had to. I contacted the Smart Price team at short notice to help move me into my new home. Their service was prompt, professional, and efficient. I own a lot of fragile pieces and they’d packed and handled everything with such care.The daunting task of moving was made such a breeze with Smart Price. I would definitely recommend them to anyone.Thanks team for a job well done! 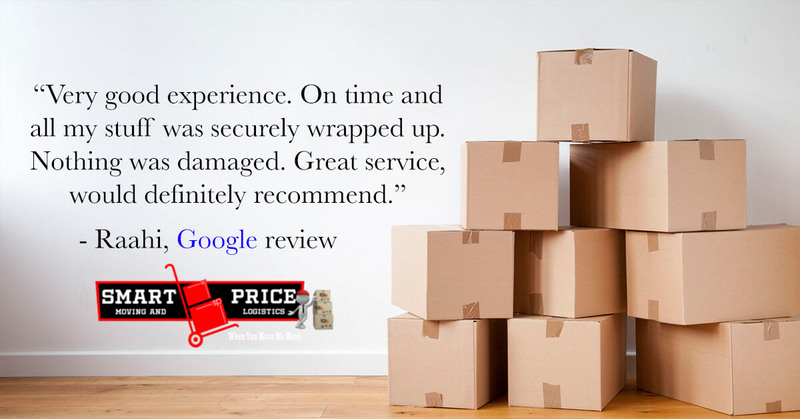 I had an amazing experience with Smart Price Moving. They guy was prompt in their arrival. They treated my furniture as if it were their own. They wrapped all of my couches and dressers to avoid any accidental damage. These gentlemen were very pleasant and a breeze to work with. Do yourself a favor and don’t think twice. Hire Smart Price Movers! Great guys who are reliable and honest. I have used them twice. These guys are the most professionals out there. They came on time, waited extra time to get the job done as well. They brought an extra person that I didn’t pay for. I recommend them to everyone that is looking to move. They take all the stress from you. I hope to use them soon hopefully when I get my own house. The owners of this company are great people. They have integrity and are very trustworthy. You can be sure that your stuff will be in good hands. Smart Price Moving Team Moved Me With Ease… Highly Recommended. Thanks, SMPT!!!!!! Very good experience. On time and all my stuff was securely wrapped up. Nothing was damaged. Great service, would definitely recommend. Awesome experience with staff and their equipment. Moving into my new home was stress-free. The whole experience was organized and pleasant. Great company. Did my work in a great time for the best price. They are insured too so I felt fine with everything they touched. Good and respectful team. Came in on time and made me feel comfortable they’ll do a good job. 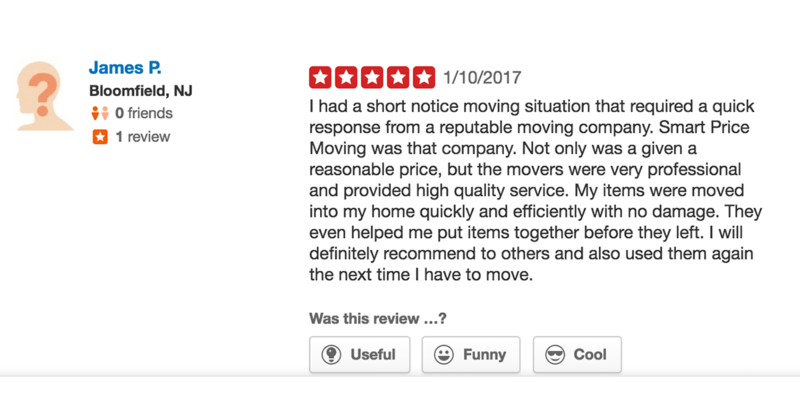 I had a short notice moving situation that required a quick response from a reputable moving company. 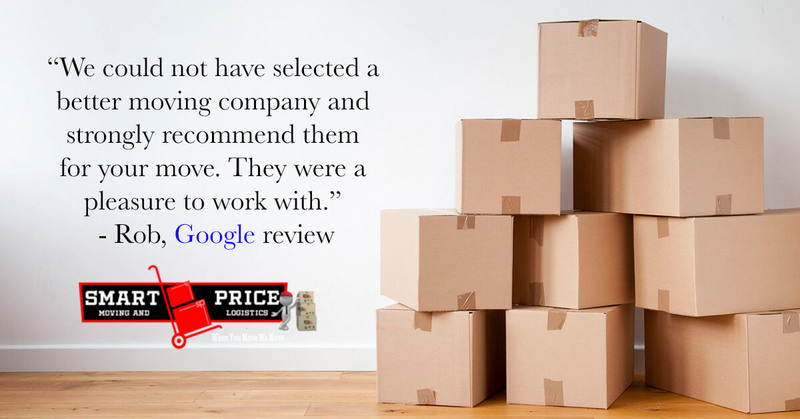 Smart Price Moving was that company. Not only was a given a reasonable price, but the movers were very professional and provided high quality service. My items were moved into my home quickly and efficiently with no damage. They even helped me put items together before they left. 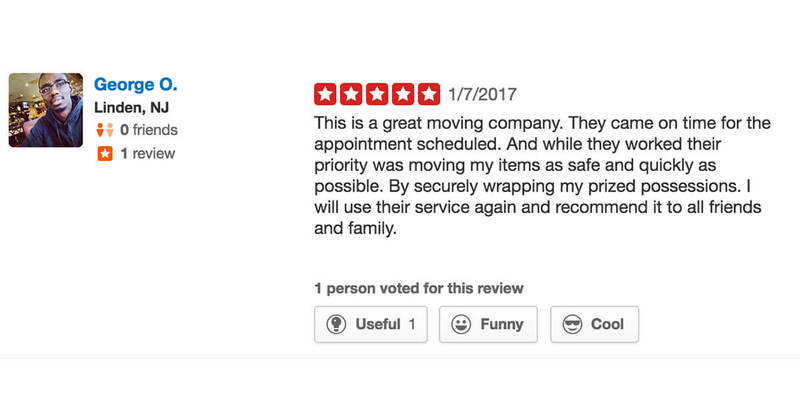 I will definitely recommend to others and also used them again the next time I have to move. This is a great moving company. They came on time for the appointment scheduled. And while they worked their priority was moving my items as safely and quickly as possible. By securely wrapping my prized possessions. I will use their service again and recommend it to all friends and family. Smart price movers were great! I needed to book a move for my elderly parents on short notice. 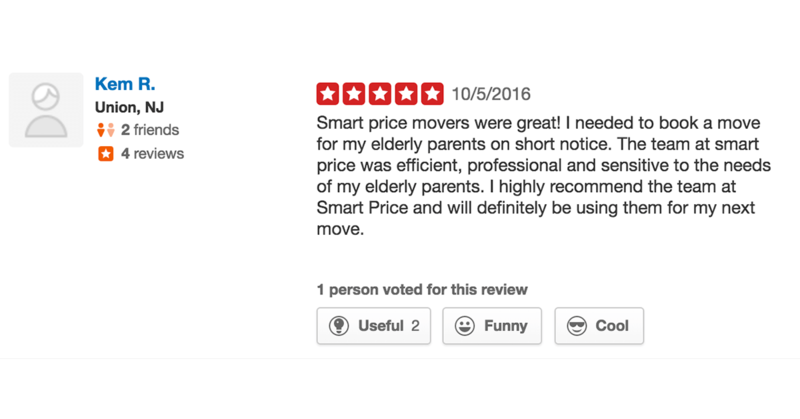 The team at smart price was efficient, professional and sensitive to the needs of my elderly parents. I highly recommend the team at Smart Price and will definitely be using them for my next move. Overall great price for the value of service. Smart Price Movers has provided nothing but exceptional customer service throughout my moving and transitional process between homes. They are very prompt, friendly, professional, and courteous. Their pricing for services is very competitive with other movers and as one can see its reflected in their name. They are the epitome of efficiency -quick turnaround in the moving process. I highly recommend their service to anyone that wants a good turnaround and a great price. The faster the turnaround the earlier you can enjoy your home. Excellent! Excellent! Excellent!!!!!!! I’ve had the opportunity to watch this company in action. They are professional, well organized and they aim to please. The best moving company thus far. Smart Price is very DEPENDABLE. Very punctual and organized. I would definitely use this Moving company again.